Tip: Take five minutes to make a batch of cashew Parmesan cheese (pictured) — delicious sprinkled on top! Serve pasta with a side salad and your favorite rustic bread. "Cacciatore" means "hunter" in Italian. (Mushroom hunters will be especially excited about this dish!) Tip: Take five minutes to make a batch of cashew Parmesan cheese (recipe below) -- delicious sprinkled on top! Serve pasta with a side salad and your favorite rustic bread. Heat olive oil and vegetable broth in a 5- or 6-quart pot. Add mushrooms and stir to coat. Cook mushrooms down for 5 to 7 minutes on a medium heat, stirring occasionally. Add onion, celery, carrot, garlic, parsley, basil, bay leaf, salt, black pepper, and red pepper flakes (if using) to pot. Stir everything to combine, being careful not to break the bay leaf. Cook for 5 to 7 minutes more. Pour the Italian-style peeled whole tomatoes into a medium-sized bowl and use your hands (or a potato masher or a wooden spoon) to break them up. Add the Italian tomatoes, tomato sauce, and red wine to the pot of vegetables. Bring to a boil, then reduce heat and simmer on low for 50 minutes or so, stirring occasionally, until sauce thickens and vegetables are tender. Cook pasta following package direction time for al dente pasta. Drain and transfer to a large bowl. Remove the bay leave from the mushroom cacciatore, pour over pasta, and toss to coat. Top with cashew Parmesan cheese and serve with baby arugula with balsamic (or your favorite side salad) and a fresh rustic bread. 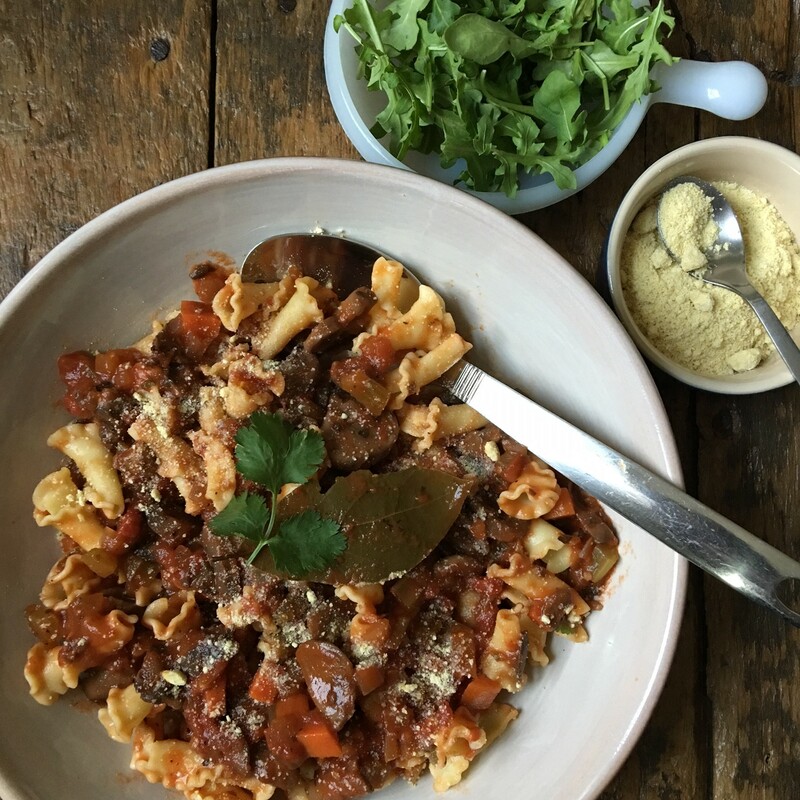 Choose your favorite pasta for this dish, but keep in mind that chunky vegetable sauces like this one tend to go best with short pastas, which have crevices to trap the sauce and veggies! In Main Dishes. Bookmark the permalink.